Maņđala 10, Anuvāka 10, Sūkta 125, Aşțaka 8, Adhyāya 7, Varga 11 & 12. Viniyoga : Should be chanted after Saptaśatī (Devī Māhātmya), for the appeasement of Śrī Jagadambikā. So, from the Parāyaņa of the hymn itself, it is clear that the Deity of Devī Sūktam is Ādyāśakti. Another Viniyoga of Devī Sūktam names ‘Paramātmā’ (Brahman) as the Deity. In Vedic age there lived a Brahmavidūşī (female Vedic scholar) named Vāgāmbhřņī, who was daughter of Řşi Ambhřņu and thus a Řşikā (female seer) herself. Brahman as Paramātmā is Sadcidānańda i.e., truth, consciousness & bliss; by realising her non-duality with Brahman, the eight verses that Řşikā Vāgāmbhřņī spoke has been documented in Řgveda as Vāk or Devī Sūktam. The hymn is the essence & application of Devī Māhātmya, and Devī Māhātmya can be seen as a commentary/explanation of Devī Sūktam. Both Devī Sūktam and Devī Māhātmya, though revealed through Řşikā Vāgāmbhřņī and Řşi Mārkaņđeyā respectively, are in reality Apauruşeya. The subject of Devī Sūktam is Sadcidānańda Paramātmā; in Devī Māhātmya Paramātmā is thought in the form of Mahāmāyā. For the namesake people believe that Ātmā and Māyā are different; but the wise and enlightened ones realise that both are same and indistinct from one another, the only difference being Paramātmā as unmanifest Brahman and Mahāmāyā as manifest Brahman. The same can be seen in Śrīmad Devī Bhāgavata Mahāpurāņa, where Śrīmat Bhuvaneśvarī declares Herself to be both Brāhman as well as Brahmaśakti. When Devī is in the state of Brahman, She alone exists; when She desires to become many i.e. to expand Herself as entire creation and the entities, She becomes Māyā-Prakřti (एकोहं बहुस्यामः)*. * To the vision blurred by Avidyā, Śiva (Brahman) and Śakti (Māyā-Prakřti) appear to be two; but when the veil of ignorance is lifted, it becomes clear that both are indistinct. What Śaivas call “Ardhanārīśvara”, Śāktas refer to it as “Śivaśakti-aikasvarūpiņī Kāmakalā”. The subject of all Śāstras is Paramātmā, who pervades all entities as Jīva irrespective of the divisions of caste, creed, cult, race etc. 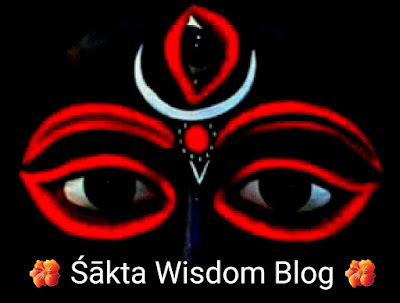 When the Jīva questions “who am I?” and becomes desireous of self realisation, he/she attains Ātmajnāna; and the Jīva underegoing this process of self-realisation is addressed as a “Sādhaka”. The process he/she undergoes is termed as “Sādhanā” and the goal achieved i.e. Brahmavidyā is “Sādhya”; any Sādhanā done without proper knowledge bear no or negative consequences. When one worships without realisation of the non-duality between Işța and Self, such worship doesn’t grant liberation; similarly activities performed without the knowledge of Self are futile. The Tatvam which has been addressed as “Aham” (Self) in Devī Sūktam has been eulogised as “Mahāmāyā” in Devī Māhātmya. There is no difference between Brahman and Brahmaśakti, as both are inseperable and indistinct like fire ad heat. I (Self) roam in the form of Rudras, the Vasus, the Ādityas, also with the Viśvadevas. I hold both Mitra and Varuņa, both Ińdra and Agni, and both the Aśvina brothers. Eleven Rudras (रोदयति सर्वमन्तकाले इति रद्रः): Vedic commenter Sāyanācārya in his commentary on Řgveda gave six possible meanings of the word ‘Rudra’; one of them is “one who makes others weep at the time of their death is known as Rudra”. The five Jnānińdriyas, the five Karmińdriyas & mind- these eleven are the Rudras and cause of births & deaths; thus the are the ones who make people weep. Due to the Ińdriyas (senses), the consciousness & knowledge we are experiencing and the mind which is helping us in experiencing, all these are verily Self. If the senses and mind go numb, we become incapable of experiencing that Self. Therefore, whatever we sense and think, all are Self. Eight Vasus: The eightfold wealth of a Sādhaka are the eight perfections (Siddhis) that manifest when Śuddhasatva becomes manifest in the Sādhaka. These eight perfections are verily Self. Twelve Ādityas: Ādityas are born of Aditi, and Aditi is Triguņātmikā Prakřti. Perception, ego, intellect and mind- these four are products of Prakřti; by resorting to the three Guņas (Satva, Rajas & Tamas) each of these four express themselves in threefold forms. Thus, the threefold divisions of perception, ego, intellect and mind are known as twelve Ādityas. These too are verily Self. Viśvadeva: The Supreme Consciousness that pervades the entire creation is termed as Viśvadeva. They are many because of the relative differences, but yet whatever we see and percieve are expressions of Self only. This can be understood by the statements “एकैवाहं जगत्यत्र द्वितीया का ममापरा” (I alone exist in this world and there is no one other than me) and “अहं विभूत्या बहुभिराह रूपैर्यदास्थिता” (I have assumed the forms of Vibhūtis to become many) made by Devī in Devī Māhātmya. Mitra-Varuņa: ‘Mitra’ is another name for the illustrious Sun god. So the Sātvika expression of the self is Mitra; in other words, Dharma is Mitra. The word ‘Mitra’ also translates into ‘friend’, and we see that Dharma is the greatest friend if us. Dharma follows us even in afterlife and provides bliss to us by assisting us to ferry across the ocean of Sańsāra. Varuņa is lord of ocean; because Adharma keeps deluged in the Sańsārārņava, thus ‘Varuņa’ here refers to Adharma. Ińdra-Agni: Ińdra is bringer of wealth and thus happiness; Agni is one who burns and hence sorrows. Aśvini Twins: Prāņa and Apāna Vāyus are called Aśvini Twins. Mitra-Varuņa, Ińdra- Agni and Aśvini Twins are dual deities expressing conflicting opposites within their respective pairs. However, all these are manifestations of the Self only, who even after expanding itself remains imperishable, transcendental and blemishless. Therefore, Ādyāśakti in the first verse of Devī Sūktam is declaring that She is the one and non-dual Brahman, imperishable, transcendental, blemishless and Empress of Spiritual Realm; but yet by Her own will She has manifested in the forms of senses, mind, perfections, perception, ego, intellect, consciousness and even the dualities. I bear the foe-destroying Soma, Tvaşțār, Pūşaņa and Bhaga. Those who perform Soma and other Yajnas in honour of deities with sufficient oblations, I bear/grant the results of Yajnas of those preceptors. ‘आहनस्’ means ‘enemy destroyer’ and ‘Soma’ refers to Somayajna. For subjugation of the invincible vices (real enemies of spirituality) Somayajna is organised. Soma translates to ‘moon’ and moon or Cańdra rules over mind. When the mind of Sādhaka subjugates his/her vices, his/her mind is then called foe-destroying Soma. Tvaşțār: Another name of Viśvakarmaņa. Therefore, one who creates the universe through mind is Tvaşțār (reference to Brahmā the creator). Pūşaņa: Another name of Sun. In other words consciousness that nourishes mind and body is known as ‘Pūşaņa’ (reference to Vişņu the nourisher). Bhaga: Refers to the six primary and other excellencies posessed by The Supreme. So the consciousness who displays Īśvaratva is Bhaga (reference to Śiva). It is important for a Sādhaka to control his/her mind and realise the non-duality of all Īśvaras as Upādhīs of Brahman, who is responsible for the creation, preservation and administration of the universe. Likewise, the Sādhaka should also realise that Brahman alone is the doer of all activities and also the enjoyer of the outcome of those activities. Therefore, Ādyāśakti in the second verse of Devī Sūktam is declaring that She is the omnipotent Brahman, who though transcendental, is cause of all causes. It is She who cleanses the Sādhaka, creates, nourishes & administers the phenomenal world, performs all activities, grants their outcome and consumes them as well. This is in sync with the first verse, where Bhagavatī has already declared that She is indistinct from the phenomenal world which is but Her own emission. I am the sole Supreme Sovereign, bestower of material wealth & spiritual fulfilment; I am Brahmavidyā, foremost among those worthy of recieving Yajnabhāga. I reside in many places, having many abodes, all-pervading; deities propitiate me as such. In this verse the Self has been addressed as a Strī Devatā i.e. as a Goddess; it now makes sense why Vāk Sūktam has been named ‘Devī Sūktam’. “अहं” or “I” is gender-neutral; but in the current context it is refferent to Ādyāśakti. Rāşțrī: The word is referrent to the Supreme Sovereign of the entire cosmos, who is responsible for the creation, preservation and annihilation of it. “Vasu” here refers to wealth/prosperity/abundance/fulfilment; in previous verses Ādyāśakti has been seen manifesting as phenomenal world from Her transcendental state, both consumer as well as the commodity and also the doer of all actions. So be it material wealth or the spiritual fulfilment, both are granted as well as consumed by Self. Cikituşī: The word is referrent to Brahmavidyā. The knowledge by which Self can be known as Brahman is Brahmavidyā, and Brahmavidyā itself is Self. Prathamā Yajniyānām: Brahmavidyā is the foremost among consumers of Yajna, since without the knowledge of Brahaman, no Yajnas are fruitful. One who knows the Self knows that oblations made to all deities during a Yajna reach Brahman, just like rain water falling from sky reach the ocean. Bhūristhātrā: It refers to the Self residing in many places. Bhūri Āveśayańtī or Bhūryāveśayańtī: It refers to all-pervasiveness of the Self. So the Self resides in many forms, and the Self again pervades each of these many forms. Tām Mā Deva Vyadadhu: Deities who know the Self as such propitiate Her always. When the Sādhaka realises that whatever is visible and also invisible is nothing but Self, then he/she displays Daivi Lakşaņas. Therefore, Ādyāśakti in the third verse of Devī Sūktam is declaring that She is the all-pervading Brahman, and the Sādhaka who realises Her as such via Brahmavidyā and propitiates Her as the Supreme, he/she displays Daivi Lakşaņas and becomes inheritor of Daivi Sampad. He who eats food, he who sees, who breathes, who hears the spoken word does so through me alone. Even the non-perceivers of you dwell near me. Hear me! he who is capable of hearing me! I speak to you the credible. The word “food” refers to edible articles. Be it protection of gross body, be it nourishment of subtle body; whatever food the entities consume, through it the Self sustains them. Vipaśyati: It refers to the action of seeing. Be it divine vision, be it physical vision; whatever the entities see, it is because of the Self. Ya: Prāņoti: The respiratory system. It is because of the Self that entities can respire and thus live. Those who deny the fact that all activities are done because of the Self and show disbelief in it, are referred to as “मां असंभव”. Usually people out of ignorance think thus “’I’ am the doer”. But they do not know who this “I” (Self) is and what is its true nature. Even those who preach about the Self are found to be not practicing the same. In the Īśāvāsyopaņişat, such people are termed as “suicidal persons”. Ta Upakşiyańte is referrent to such dualistic people. Such people are regarded ungrateful and bear the consequences of the same. For example, you are travelling by a crowded city bus or a local train and a petty thief sneaks away with your wallet. Now you need to change your bus/train to reach home and by the time realisation dawns upon you, it is already too late. Maybe at home you hardly care about a couple of ten Rupee bills, but now when you need them you have nothing. Now imagine that a person headed towards the same destination as you comes and help you in your time of distress by paying your fare; if you are a grateful person you will never forget this gesture of generosity by your saviour. However, when it comes to the nourishment and other things that keep us alive, you take them for granted and do not show your gratitude towards the Self; somewhat similar to the unconditional love of a mother, which is taken for granted and the service she renders is assumed to be her duty. Therefore, Ādyāśakti in the fourth verse of Devī Sūktam is declaring that She is the all-providing Brahman, and it is because of Her generosity that we exist. She is the Śakti (energy) that enables us to perform every kind of activities. Hence, we should be grateful to Her and never ignore the fact that it is by Her grace that the phenomenol world functions. The Sādhaka who realises Ādyāśakti as such and propitiates Her as the Supreme, he/she displays Daivi Lakşaņas and becomes inheritor of Daivi Sampad. I speak this myself, which is liked by boths gods and men alike; whomever I wish, I uplift him, I grant the post of Brahmā, a great seer and bestow upon him perfect knowledge. Who else other than the Self can describe Ātmatatvam? Because the Self itself is the known, the knower, the speaker and the seeker as well; thus, ‘Ahameva Svayamidam Vadāmi’, and this knowledge is sought by both dieties as well as mortals alike. Brahmā, Vişņu, Maheśvara themselves meditate upon that Self for time immemorial; this is known from different Purāņas. What to speak of Devas and humans, when the Trimūrti despite of their Supreme position find the grace of Self inaccessible! Jūşțham: Refers to service. The deities and mortals knowingly or unknowingly indulge in the service of the Self; those who serve unknowingly serve the Self limited to this body, while those who serve knowingly serve the Self who has no limits and is all-pervasive. Yam Kāmaye: It is the Self who uplifts the Jīva. Upliftment can be worldly or spiritual. Worldly upliftment can be happiness, fame, eminence or prosperity, which are achieved by hard work; the force which impells us to work hard is verily the Self. Spiritual uplifted person can be a thinker, a seer and Brahmā. When a person gets first taste of spirituality, he/she becomes a thinker or a person worth of recieving Ātmajnāna; until that happens, all sermons on spirituality are ramblings to the person. This is the first stage of spiritual upliftment. Next comes the state of being a seer. When a Sādhaka seeks Brahman & experiences Brahman to be all-pervading, and when this experience gets expressed in words, it becomes a Mańtra; the Sādhaka who composed the Mańtra is then known as the seer. Third is the stage of Brahmā. Brahmā is Hiraņyagarbha- the centre of creation, preservation and annihilation. Till the end of a creation cycle, the Jīva resides in this Brahmaloka. All these processes happen by the will of Self. For annihilation of the opposers of Brahmavidyā, I stretch the bow of Rudra. I fight battles for people. I have pervaded heaven and earth. Lord Rudra (रुत् संसाराख्यं दुःख तत् द्रावयति इति रुद्रः) : Vedic commenter Sāyanācārya in his commentary on Řgveda gave six possible meanings of the word ‘Rudra’; one of them is “one who melts the sorrows of the world is known as Rudra”. A verse from Upaņişats states thus “प्रणवो धनु शरोह्यात्मा ब्रह्म तल्लक्षमुच्यते” [Praņava (ॐ/ह्रीं) is the bow, Ātmajnāna is arrow and Brahman is the aim] . While analysing the first verse we saw that Rudra in the form of senses & mind is the cause of sorrows, and now Rudra is remover of sorrows. Sorrows are the opposers of Brahmavidyā, by which Brahman can be achieved. Hence, the Self is stretching the bow of the remover of sorrows to slay the cause of sorrows. It makes sense, because another meaning of ‘Rudra’ according to Sāyanācārya is “रुत् आत्मविद्या तामुपासकेभ्यो राति ददाति इति रुद्रः” (one who bestows the knowledge of self upon Upāsakas is known as Rudra). So one can say that the Self who as Avidyā or Māyā creates the illusion of dualities becomes Brahmavidyā when propitiated, and by dissolving the illusions the Self impells the Upāsaka towards Brahman. Aham Janāya Samadam Křņomi: The Self wages wars for the Jīva. When the Jīva bestowed with Daivi Sampad desires to establish spiritual kingdom, the senses intervene and create hurdles. It is then that the Self wages war against the senses on behalf of the Jīva. Aham Dyāvāpřthivī Āviveśa: The Self pervades heaven and earth. Heaven or Devaloka is the Vijnānamaya Koşa, where the Ātmajnāna reaches its conclusion and the blissful exellence of Brahman becomes visible. Earth or Bhūloka is the Annamaya Koşa; since other Koşas span in between these two, they haven’t been mentioned seperately. Annamaya Koşa is Brahmāņđa, Prāņamaya Koşa is the forces that govern Brahmāņđa, Manomaya Koşa is the wish of becoming many from one, Vijnānamaya Koşa is where many merge into one, and finally Ānańdamaya Koşa is where the Self is Sadcidānańda Brahman. Therefore, Ādyāśakti in the sixth verse of Devī Sūktam is declaring that She is the absolute Brahman, who wages war & slays the near-bestial lowest form of awareness, greed, rage, deception, brutality, falsehoods, desires, attachment and vanity for the protection of Her Upāsakas. She pervades the phenomenal world in many stages, with the lowest of all stages leading upwards to Brahman. I generate the progenitor; above this, inside the Vijnānamaya Koşa within the Ānańdamaya Koşa, is situated my casual body. Thence, I pervade all living creatures, and with the vertex I touch that sky. Hiraņyagarbha is the progenitor from whom all entities are born; this Hiraņyagarbha is the Virāța Puruşa, but it is the Self who generated even the progenitor. Asya Mūrdhan Mama Yonirapsvanta: Samudre: ‘Samudra’ means bliss. The word ‘समुद्र’ is formed of verbs ‘सम्/सम्यक्’ and ‘उद’; what moistens equally is known as ‘Samudra’. In the context of Jīva, it is bliss that moistens the entity with sentiments and hence Samudra refers to bliss. Sāyanācārya equated bliss with the Self; he also opined that ‘अप्’ (water) refers to the all pervading intellect. Intellect is the Vijnānamaya Koşa. So from this, we can say that the Vijnānamaya Koşa which is within the Ānandamaya Koşa is the casual body of the Self and is situated atop Hiraņyagarbha and thus Mama Yoni:. Tatovitişțhe Bhuvanānuviśvā: The Self pervades all worlds and resides in them. Tāmudyāmvarşmaņo Paspřśāmi: The Highest Region which has been described as the Vijnānamaya Koşa is pervaded by the Self; even the Brahmāņđa is the Sadcidānańda Self. But by becoming able to dwell in both realms does one experience the touch of the Self. Therefore, Ādyāśakti in the seventh verse of Devī Sūktam is declaring that She is the primordial Brahman, who generates everything and dwells within them after having pervaded them. When I flow like the winds, the creation of all worlds begin. I predate and outdate the heaven and the earth; this is my greatness. “Flowing like winds” is metaphor for the acts of Krīyāśakti. In the process of creation, the space element is inactive, changeless and hence acts as base. But the wind element is active. Upaņişats opine thus- “यथाकाशस्थितो नित्यं वायुः सर्वत्रगो महान् । तथा सर्वाणि भूतानि मत्स्थानीत्युपधारय” (As the mighty wind, moving always everywhere, rests ever in the space, know that even so do all beings rest in Me.) When the Jīva becomes desirous of knowing the Self, its activities are governed by the Krīyāśakti; while moving towards the Self, it is like the flowing wind. This is why in Brahmasūtras the enquiry of Brahman has been respinded to as “जन्माद्यस्य यतः”; the one from whom everything emmanates, the one on whom everything rests, and the one in whom everything disdolves back, is verily Brahman, Paramātmā and Self. By using feminine “Ārabhamāņa” in the current verse, it has been once again denoted that the deity of this hymn who is Brahman, is a Strī Devatā who is progenitor, nourisher and annihilator of the phenomenal world; She is the one who is the aim and object of worship for all. Till the time phenomenal world is in existence, She will act as the Krīyāśakti or Mahāmāyā, active like winds and guiding Jīvas towards Her Brahman aspect. Apart from this, beyond the phenomenal world and the heaven, there is a transcendental state of the Self which is beyond our comprehension; this Highest State is the destination of all worship. This has bern expressed as “Paro Divā Para Enā Přthivī Etāvati Mahimā”. There are no blemishes in the Eternal and Transcendental Brahman; and yet the Self is able to manifest as the phenomenal and other worlds. This is Her greatness which has been sung in Brahmasūtras as well. Therefore, Ādyāśakti in the eighth verse of Devī Sūktam is declaring that She is the eternal Brahman, who is transcendental and yet manifest; who is final goal of all worship, who is The Supreme Person and also the attractive force as Yogamāyā/Mahāmāyā, Krīyāśakti and Brahmavidyā. It is She who is situated at the Highest Summit, and again it is She who has become everything by Her Will; at the end, it is She who liberates by granting Mokşa/Nirvāņa and also it is She who is the final destination.